We talked to veteran industry professionals across our organization to find out what today’s top workspace trends are. Collaboration is still a clear leader, but we also learned a great deal more. We’ve compiled our favorite responses below in a quick list to keep you up to date on the modern workspace. 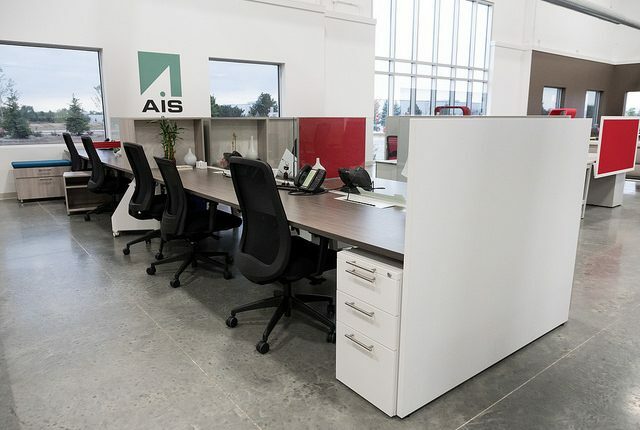 Lower smaller work areas, smaller private offices, mobile work force, ancillary furniture, soft seating small meeting areas. Today’s office often resembles more of a college campus than it does a traditional work environment. Collaboration, collaboration, collaboration. HOWEVER, a happy medium must be developed to provide an open environment, but still provide the privacy required and also the opportunity for individuals to strive for something within their office environment, i.e., a private office. 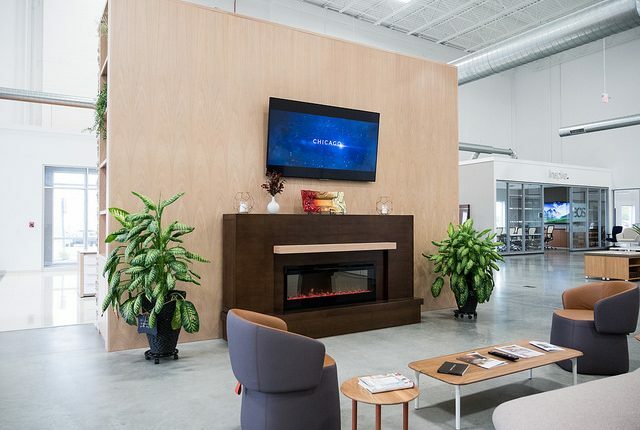 The end of permanent workplace layouts for organic workspaces that provide community areas, easy connectivity throughout the space along with products that provide personal control to provide a healthier work environment and facilitate collaboration and enhanced performance. 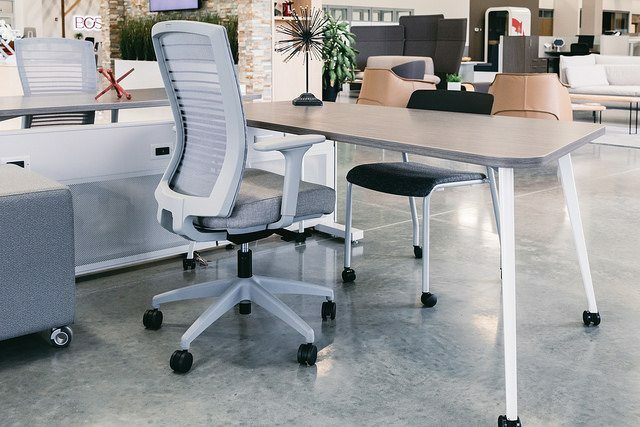 Smaller workstations and lower horizons are still important to clients, but these need to be balanced with alternative areas to work and have private conversations. Often times clients forget to create enough phone rooms or closed/semi-enclosed small meeting spaces. I see the open workplace bouncing back to being more closed off. Panels are coming back and a bit higher than before. I also see the push to buy furniture that is highly adjustable. Compose Connections, beam systems, changing environments quickly with minimal work needed. Many companies are attempting to attract “STEM” qualified candidates. The prospects are usually younger and are attracted to a magnitude of different philosophy’s not only in commercial workspaces, but in lifestyle as well. Trends are flexibility, team atmosphere, well being. Depending on the culture of the company the following can be included. Collaborative workspaces, multipurpose spaces that promote playfulness, bringing nature indoors, privacy areas. While the obvious is low open offices, benching, access to natural light, healthy habits such as standing and access to water. I think this is evolving to practical departmental neighborhoods, flexible work spaces, functional spaces that are not too busy or loud. William ReidSenior Account Manager, AOI IL. Collaboration has been a hot topic ever since the cubicle walls came down and businesses started migrating to open office plans. Touchdown areas and common spaces sound great on a plan – but if they aren’t used, they are just pretty looking spaces. Forward thinking companies are integrating technology and workspace strategy to enable teams to put collaborative workspaces to use more effectively. Open and collaborative spaces. People are working in teams now more than ever, and very rarely are they sitting at their desks all forty hours of the week. Writable surfaces are creative, fun, and collaborative. You are seeing less walls and more marker boards and glass. Fun, comfortable, lounge areas. Employees now are bringing their clients back to the office. 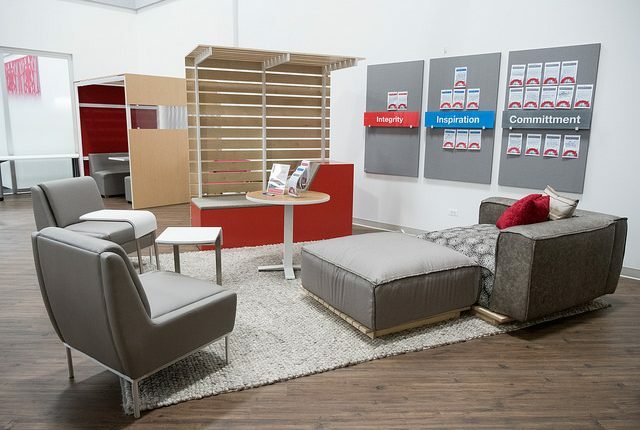 Show them how a lounge space can be a productive meeting space. Me and We Workspaces, meaning workstations now are hubs for employees to interact and be more productive as opposed to individual work. Development of Third Space (lounge areas, coffee bars, alternative work areas for use during the day). The addition of the comforts of home to workstations. 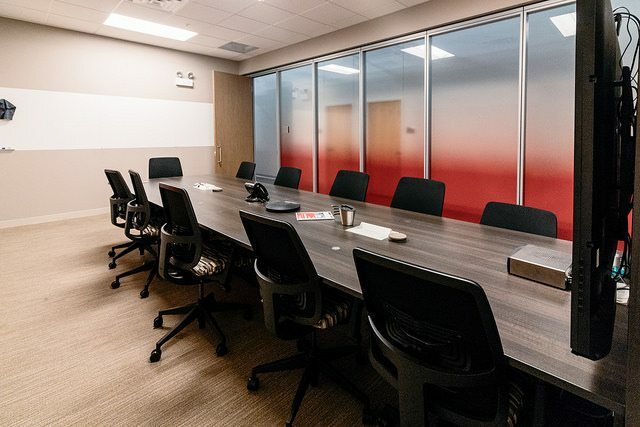 Some of the top trends in commercial workspaces are Community work areas, the end of permanent workstations, eco-friendly spaces, the return of post modern furniture designs, and an increase in the introduction of color to the workspace. Collaboration & Teams are preferred over individual performance. Individual areas dedicated to have one-on-one private conversations, take a couple minutes to decompress & relax without distractions, a space for high focus tasks hidden from the open office, etc. Staying up-to-date with technology capabilities integrated in furniture. Reduction in the amount of dedicated workstations. Individual workstations have been replaced by temporary touchdown workstations or lounge areas with electrical access. Lighting features integrated into furniture and/or within the design of the room. The best ideas are developed when people are able to brainstorm with their team members in a creative and comfortable space. A major trend I am seeing is large lounge areas with all different types of creative seating. Bean bags, swings, and adult jungle gyms are a few of the out-of-the-box lounge areas that I have seen recently.